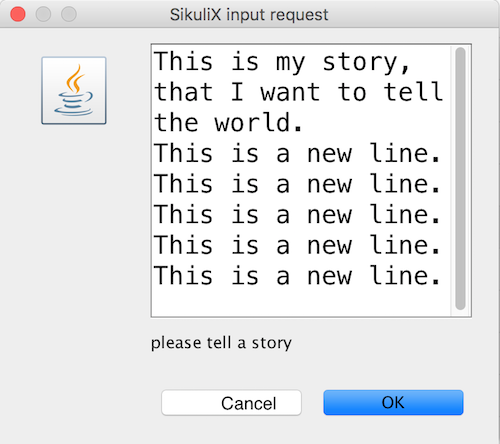 In the standard the following dialog boxes are shown in the middle of the screen, where SikuliX (IDE or from commandline) is running (usually the primary screen). As a backport from SikuliX version 2 I added the timed/autoclosing versions of popup, popAsk, popError and input. For more information look here. They are always on top from the beginning, no matter which application currently is the frontmost. While the dialog is visible, you might move it around and act on other applications, until you work with the dialog box. If you want the dialog to appear in a special location on the screen (even on other screens in multimonitor situations), you can use the function popat() to define this location. The dialog will be positioned here with the center of its dialog panel. Be aware, that locations near the edge of the screen might make parts of the dialog not accessible (this is not checked). This location will stay in effect until changed by another use of popat(). A popat() without parameters will reset it to the standard (center of primary screen). Define the location, where the center of popup dialogs should be positioned from now on. If no parameter is given, the location will be reset to the center primary screen (default). Display a dialog box with an OK button and text as the message. The script then waits for the user to click the OK button. 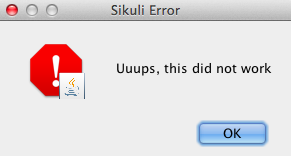 Same as popup() but with a different title (default Sikuli Error) and alert icon. 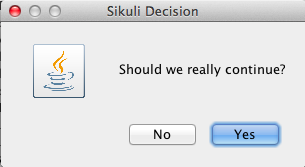 Same as popup() but with a different title (default Sikuli Decision) and alert icon. There are 2 buttons: Yes and No and hence the message text should be written as an appropriate question. Display a dialog box with an input field, a Cancel button, and an OK button. The optional text title is displayed as the messagebox title and the text msg as some explanation near the input field. The script then waits for the user to click either the Cancel or the OK button. A dialog box that looks like above will appear to allow the user to interactively enter some text. This text is then assigned to the variable name, which can be used in other parts of the script, such as paste(name) to paste the text to a login box. When using the parameter default, the text input field will be pre-populated with the given text, so the user might just click OK/Cancel or edit the content of the input field. As the user inputs his secret infoemation, the text is shown as one asterisk per character. A message box with the given height and width is displayed and allows the user to input as many lines of text as needed. The lines are auto-wrapped at word boundary. A vertical scrollbar is shown if needed. The default font is the Java AWT Dialog (a sans-serif font) in size 14, which is also the minimum size possible. One might switch to a monospace font using Settings.InputFontMono=True. Setting it to False switches it back to the standard for the next inputText(). A bigger size than 14 can be set using Settings.InputFontSize=NN. Setting it to a value smaller than 14 (e.g. 0) will reset it to 14 again. Displays a dropdown menu containing the given options list items with the default selected. The user might select one item and click ok. Display a file open dialog, that lets the user select a folder or file. As a backport from SikuliX version 2 I added the timed/autoclosing versions of popup, popAsk, popError and input. the respective methods are implemented in the class org.sikuli.script.Do (this corresponds to the implementation of all toplevel features in SikuliX version 2 in com.sikulix.api.Do). Hence the usage in scripts is upward compatible. At the Java level at least the import would have to be changed. the usage in all cases is returnValue = Do.function(). Do not try any other usage, since this might clash with existing version 1 implementations. since the implementation is only on the Java level, there are no named parameters (unlike the known non-timed versions of popup, popAsk, …). Nevertheless it is possible to only give a subset of parameters, as long as the defined sequence is obeyed. In doubt use None/null for a parameter, to get the default value. See the given examples for use cases. if the dialog is autoclosed by intention, the return value is None/null in all cases. location a Region object, over which the dialog will be displayed centered (all methods, default screen center) which allows to place the dialog anywhere on the screen. As a convenience you can use Region(x, y) if you want to specify a point. Hence no need to use popAt(). Display an informational message with an OK button. print "user did not click ok"
Display an informational message with YES and NO button. Display an error message with an OK button. # with a box title as "Severe Error"
Display an informational message and ask for a text input with a possible preset text in the input field. The dialog has an OK and a Cancel button. With the hidden parameter as True/true the text in the input field will be shown as dots (not readable). # with a box title as "A filename"
# and a preset input field containing "someImage.png"
print "we will use a default file name"
print "not allowed - exiting"
Sikuli can listen to global hotkeys that you register with Env.addHotkey and call the corresponding handler (sikuli functions) when the user presses the hotkeys. BE AWARE Be sure, that the key combination you use is free and not used by the system or any other application. The hotkey feature may not report an error in such situations and as a consequence your hotkey definition simply does not work as expected. An example is the F12 key on Windows alone or with SHIFT, which in the standard is occupied by the system as global debugging key (might be released by hacking the registry). Register the specified key + modifiers as a global hotkey. When the hotkey is pressed, the specified function handler will be called. key – a character or a constant value defined in Key. modifiers – Key modifiers, which can be one or multiple constants defined in KeyModifier. 4# When the user pressed Ctrl+Alt+F1, click the top-left apple icon. Unregister the registered global hotkey key + modifiers. It keeps the handlers free from processing code, just signals the keypress using a global variable to the main loop. The main loop simply permanently scans the global variables and then does what has to be done. The whole process is blocking in the sense, that hotkeys are processed one after the other in the sequence they appear in the main loop and each hotkey is only recognized again, after its current press is processed in the main loop. This setup keeps things more transparent and straightforward. Other setups even with threading are possible, but need much more effort to correctly synchronize the processing especially when mouse or keyboard actions are involved. The variants to end the script show a graceful version (ctrl-alt-q) and a brute-force version (ctrl-alt-x). The graceful version just signals the keypress via a global variable and leaves it to the main workflow to react, when it makes sense. Here we talk about the basic features of opening or closing other applications and switching to them (bring them to front). For the more sophisticated usages including some basic handling of application windows look class App. You can use the feature run(someCommand) to delegate something, you can do on a commandline, to a seperate process. The script waits for completion and you have acces to the return code and the output the command has produced. NOTE on Java usage At the Java level only the features of the App class are available (class App). In a Sikuli script in normal strings enclosed in ” (double apostrophes), these special characters \ and ” have to be escaped using a backslash, when you have them inside the string. So for one backslash you need \ and for one ” you need ". In a string enclosed in ‘ (single apostrophes), a ‘ has to be ' and a ” is taken as such. To avoid any problems, it is recommended to use the raw string r'some text with \ and " ...', since there is no need for escaping (but no trailing \ is allowed here). This is especially useful, when you have to specify Windows path’s containing blanks or want to setup command lines for use with openApp(), App.open(), run(), os.popen() or Jythons Subprocess module. NOTE for Mac users As application name use the name, that is displayed with the program symbol on the taskbar, which might differ from what is displayed in the top left of the menu bar. Example: The Chrome browser displays “Chrome” in the menu bar, but the application name is “Google Chrome”. So openApp(“chrome”) will fail, whereas openApp(“google chrome”) will do the job. Same goes for switchApp() and closeApp(). Open the specified application, or swith to it, if it is already open. application – a string containing the name of an application (case-insensitive), that can be found in the path used by the system to locate applications. Or it can be the full path to an application. This function opens the specified application and brings it to front. It might switch to an already opened application, if this can be identified in the process list. Windows: A running instance will be ignored in any case and hence in most cases a new instance of the program will be started. Bring the matching application or window to front (make it the active/focused application/window). If no matching application/window can be found, it is tried to open an application using the given string as program name or location. application – the name of an application (case-insensitive) or (part of) a window title (Windows/Linux) (case-sensitive). This function switches the input focus to the specified application (brings it to front). Windows: In the first step, the given text is taken as part of a program name (not case sensitive). If it is found in the process list, it will be switched to front, if it has a main window (registered in the process list). Otherwise the text will be used to search for a matching window title. Windows/Linux: the window is identified by scanning the titles of all accessible windows for the occurence of the application string. The first window in the system specific order, whose title contains the given text, is given focus. Mac: the string application is used to identify the application. If the application has multiple windows opened, all these windows will be brought to the front with unchanged z-order, which cannot be influenced currently. # works, because all Firefox window titles contain "Mozilla Firefox"
This function closes the application indicated by the string application (Mac) or the windows whose titles contain the string application (Windows/Linux). On Windows/Linux, the application itself may be closed if the main window is closed or if all the windows of the application are closed. command – a command that can be run from the command line. This function executes the command and the script waits for its completion.